Bush v. Gore (2000). Question: Should the ballot recount mandated by the Florida Supreme Court be allowed to continue? 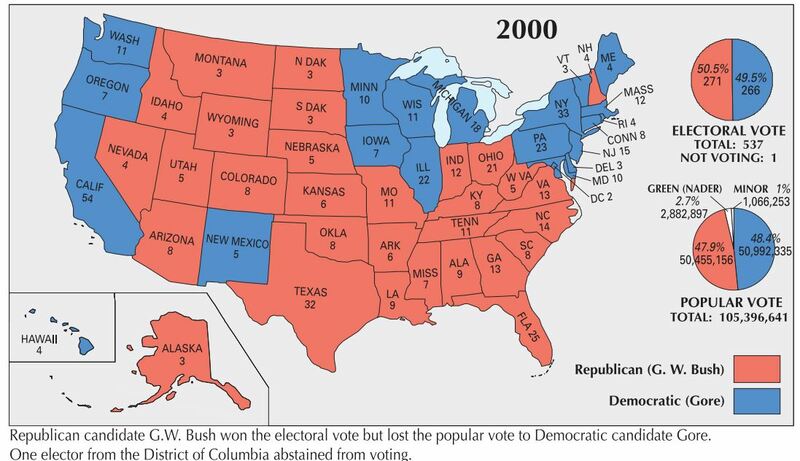 On November 26, the Florida Elections Canvassing Commission certified the results of the election and declared Governor Bush the winner of Florida’s 25 electoral votes. On November 27, Vice President Gore, pursuant to Florida’s contest provisions, filed a complaint in Leon County Circuit Court contesting the certification . . . The Supreme Court held that Vice President Gore had satisfied his burden of proof with respect to his challenge to Miami-Dade County’s failure to tabulate, by manual count, 9,000 ballots on which the machines had failed to detect a vote for President (“undervotes”). Noting the closeness of the election, the Court explained that “[o]n this record, there can be no question that there are legal votes within the 9,000 uncounted votes sufficient to place the results of this election in doubt.” A “legal vote,” as determined by the Supreme Court, is “one in which there is a ‘clear indication of the intent of the voter. ’ ” The court therefore ordered a hand recount of the 9,000 ballots in Miami-Dade County. Observing that the contest provisions vest broad discretion in the circuit judge to “provide any relief appropriate under such circumstances,” Fla. Stat. §102.168(8) (2000), the Supreme Court further held that the Circuit Court could order “the Supervisor of Elections and the Canvassing Boards, as well as the necessary public officials, in all counties that have not conducted a manual recount or tabulation of the undervotes … to do so forthwith, said tabulation to take place in the individual counties where the ballots are located.” . . . As to Miami-Dade County, the Court concluded that although the 168 votes identified were the result of a partial recount, they were “legal votes [that] could change the outcome of the election.” The Supreme Court therefore directed the Circuit Court to include those totals in the certified results, subject to resolution of the actual vote total from the Miami-Dade partial recount. The petition presents the following questions: whether the Florida Supreme Court established new standards for resolving Presidential election contests, thereby violating Art. II, §1, cl. 2, of the United States Constitution and failing to comply with 3 U.S.C. § 5 and whether the use of standardless manual recounts violates the Equal Protection and Due Process Clauses. With respect to the equal protection question, we find a violation of the Equal Protection Clause. There is no difference between the two sides of the present controversy on these basic propositions. Respondents say that the very purpose of vindicating the right to vote justifies the recount procedures now at issue. The question before us, however, is whether the recount procedures the Florida Supreme Court has adopted are consistent with its obligation to avoid arbitrary and disparate treatment of the members of its electorate. 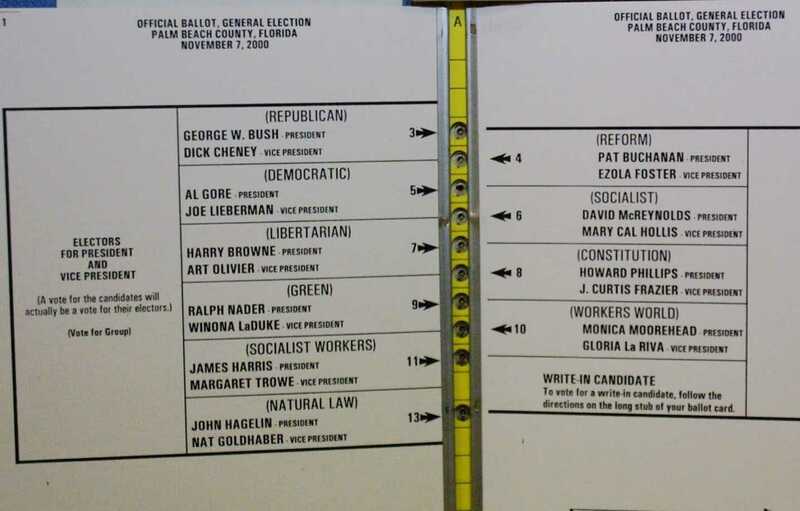 Much of the controversy seems to revolve around ballot cards designed to be perforated by a stylus but which, either through error or deliberate omission, have not been perforated with sufficient precision for a machine to count them. In some cases a piece of the card–a chad–is hanging, say by two corners. In other cases there is no separation at all, just an indentation. The Florida Supreme Court has ordered that the intent of the voter be discerned from such ballots. For purposes of resolving the equal protection challenge, it is not necessary to decide whether the Florida Supreme Court had the authority under the legislative scheme for resolving election disputes to define what a legal vote is and to mandate a manual recount implementing that definition. The recount mechanisms implemented in response to the decisions of the Florida Supreme Court do not satisfy the minimum requirement for non-arbitrary treatment of voters necessary to secure the fundamental right. Florida’s basic command for the count of legally cast votes is to consider the “intent of the voter.” This is unobjectionable as an abstract proposition and a starting principle. The problem inheres in the absence of specific standards to ensure its equal application. The formulation of uniform rules to determine intent based on these recurring circumstances is practicable and, we conclude, necessary. The law does not refrain from searching for the intent of the actor in a multitude of circumstances; and in some cases the general command to ascertain intent is not susceptible to much further refinement. In this instance, however, the question is not whether to believe a witness but how to interpret the marks or holes or scratches on an inanimate object, a piece of cardboard or paper which, it is said, might not have registered as a vote during the machine count. The factfinder confronts a thing, not a person. The search for intent can be confined by specific rules designed to ensure uniform treatment. The want of those rules here has led to unequal evaluation of ballots in various respects. As seems to have been acknowledged at oral argument, the standards for accepting or rejecting contested ballots might vary not only from county to county but indeed within a single county from one recount team to another.
. . . The State Supreme Court ratified this uneven treatment. It mandated that the recount totals from two counties, Miami-Dade and Palm Beach, be included in the certified total. The court also appeared to hold sub silentio that the recount totals from Broward County, which were not completed until after the original November 14 certification by the Secretary of State, were to be considered part of the new certified vote totals even though the county certification was not contested by Vice President Gore. Yet each of the counties used varying standards to determine what was a legal vote. Broward County used a more forgiving standard than Palm Beach County, and uncovered almost three times as many new votes, a result markedly disproportionate to the difference in population between the counties. In addition, the recounts in these three counties were not limited to so-called undervotes but extended to all of the ballots. The distinction has real consequences. A manual recount of all ballots identifies not only those ballots which show no vote but also those which contain more than one, the so-called overvotes. Neither category will be counted by the machine. This is not a trivial concern. At oral argument, respondents estimated there are as many as 110,000 overvotes statewide. As a result, the citizen whose ballot was not read by a machine because he failed to vote for a candidate in a way readable by a machine may still have his vote counted in a manual recount; on the other hand, the citizen who marks two candidates in a way discernable by the machine will not have the same opportunity to have his vote count, even if a manual examination of the ballot would reveal the requisite indicia of intent. Furthermore, the citizen who marks two candidates, only one of which is discernable by the machine, will have his vote counted even though it should have been read as an invalid ballot. The State Supreme Court’s inclusion of vote counts based on these variant standards exemplifies concerns with the remedial processes that were under way.
. . . The recount process, in its features here described, is inconsistent with the minimum procedures necessary to protect the fundamental right of each voter in the special instance of a statewide recount under the authority of a single state judicial officer. Our consideration is limited to the present circumstances, for the problem of equal protection in election processes generally presents many complexities.
. . . Upon due consideration of the difficulties identified to this point, it is obvious that the recount cannot be conducted in compliance with the requirements of equal protection and due process without substantial additional work. It would require not only the adoption (after opportunity for argument) of adequate statewide standards for determining what is a legal vote, and practicable procedures to implement them, but also orderly judicial review of any disputed matters that might arise. In addition, the Secretary of State has advised that the recount of only a portion of the ballots requires that the vote tabulation equipment be used to screen out undervotes, a function for which the machines were not designed. If a recount of overvotes were also required, perhaps even a second screening would be necessary. Use of the equipment for this purpose, and any new software developed for it, would have to be evaluated for accuracy by the Secretary of State, as required by Fla. Stat. §101.015 (2000).
. . . None are more conscious of the vital limits on judicial authority than are the members of this Court, and none stand more in admiration of the Constitution’s design to leave the selection of the President to the people, through their legislatures, and to the political sphere. When contending parties invoke the process of the courts, however, it becomes our unsought responsibility to resolve the federal and constitutional issues the judicial system has been forced to confront. The judgment of the Supreme Court of Florida is reversed, and the case is remanded for further proceedings not inconsistent with this opinion. Justice Ginsburg, with whom Justice Stevens joins, and with whom Justice Souter and Justice Breyer join as to Part I, dissenting. My colleagues have offered a reasonable construction of Florida’s law. Their construction coincides with the view of one of Florida’s seven Supreme Court justices . . . I might join The Chief Justice were it my commission to interpret Florida law. But disagreement with the Florida court’s interpretation of its own State’s law does not warrant the conclusion that the justices of that court have legislated. There is no cause here to believe that the members of Florida’s high court have done less than “their mortal best to discharge their oath of office,” and no cause to upset their reasoned interpretation of Florida law.
. . . No doubt there are cases in which the proper application of federal law may hinge on interpretations of state law. Unavoidably, this Court must sometimes examine state law in order to protect federal rights. But we have dealt with such cases ever mindful of the full measure of respect we owe to interpretations of state law by a State’s highest court. . . . Just last Term, in Fiore v. White (1999), we took advantage of Pennsylvania’s certification procedure. In that case, a state prisoner brought a federal habeas action claiming that the State had failed to prove an essential element of his charged offense in violation of the Due Process Clause. Id., at 25—26. Instead of resolving the state-law question on which the federal claim depended, we certified the question to the Pennsylvania Supreme Court for that court to “help determine the proper state-law predicate for our determination of the federal constitutional questions raised.” Id., at 29; id., at 28 (asking the Pennsylvania Supreme Court whether its recent interpretation of the statute under which Fiore was convicted “was always the statute’s meaning, even at the time of Fiore’s trial”). The Chief Justice’s willingness to reverse the Florida Supreme Court’s interpretation of Florida law in this case is at least in tension with our reluctance in Fiore even to interpret Pennsylvania law before seeking instruction from the Pennsylvania Supreme Court. I would have thought the “cautious approach” we counsel when federal courts address matters of state law, Arizonans, 520 U.S., at 77, and our commitment to “build[ing] cooperative judicial federalism,” Lehman Brothers, 416 U.S., at 391, demanded greater restraint. Rarely has this Court rejected outright an interpretation of state law by a state high court. Fairfax’s Deviseev. Hunter’s Lessee, (1813), NAACP v. Alabama ex rel. Patterson, (1958), and Bouie v. City of Columbia, (1964), cited by The Chief Justice, are three such rare instances. But those cases are embedded in historical contexts hardly comparable to the situation here. Fairfax’s Devisee, which held that the Virginia Court of Appeals had misconstrued its own forfeiture laws to deprive a British subject of lands secured to him by federal treaties, occurred amidst vociferous States’ rights attacks on the Marshall Court. The Virginia court refused to obey this Court’s Fairfax’s Devisee mandate to enter judgment for the British subject’s successor in interest. That refusal led to the Court’s pathmarking decision in Martin v. Hunter’s Lessee. Patterson, a case decided three months after Cooper v. Aaron, (1958), in the face of Southern resistance to the civil rights movement, held that the Alabama Supreme Court had irregularly applied its own procedural rules to deny review of a contempt order against the NAACP arising from its refusal to disclose membership lists. We said that “our jurisdiction is not defeated if the nonfederal ground relied on by the state court is without any fair or substantial support.” Bouie, stemming from a lunch counter “sit-in” at the height of the civil rights movement, held that the South Carolina Supreme Court’s construction of its trespass laws–criminalizing conduct not covered by the text of an otherwise clear statute–was “unforeseeable” and thus violated due process when applied retroactively to the petitioners. The Chief Justice’s casual citation of these cases might lead one to believe they are part of a larger collection of cases in which we said that the Constitution impelled us to train a skeptical eye on a state court’s portrayal of state law. But one would be hard pressed, I think, to find additional cases that fit the mold. As Justice Breyer convincingly explains, this case involves nothing close to the kind of recalcitrance by a state high court that warrants extraordinary action by this Court. The Florida Supreme Court concluded that counting every legal vote was the overriding concern of the Florida Legislature when it enacted the State’s Election Code. The court surely should not be bracketed with state high courts of the Jim Crow South.
. . . The extraordinary setting of this case has obscured the ordinary principle that dictates its proper resolution: Federal courts defer to state high courts’ interpretations of their state’s own law. This principle reflects the core of federalism, on which all agree. . . . Were the other members of this Court as mindful as they generally are of our system of dual sovereignty, they would affirm the judgment of the Florida Supreme Court. I agree with Justice Stevens that petitioners have not presented a substantial equal protection claim. Ideally, perfection would be the appropriate standard for judging the recount. But we live in an imperfect world, one in which thousands of votes have not been counted. I cannot agree that the recount adopted by the Florida court, flawed as it may be, would yield a result any less fair or precise than the certification that preceded that recount.
. . . The Court assumes that time will not permit “orderly judicial review of any disputed matters that might arise.” But no one has doubted the good faith and diligence with which Florida election officials, attorneys for all sides of this controversy, and the courts of law have performed their duties. Notably, the Florida Supreme Court has produced two substantial opinions within 29 hours of oral argument. In sum, the Court’s conclusion that a constitutionally adequate recount is impractical is a prophecy the Court’s own judgment will not allow to be tested. Such an untested prophecy should not decide the Presidency of the United States.